The story begins with a fortune, a $20 million inheritance left to the small-town oddball and poet, Longfellow Deeds (Gary Cooper). Deeds must go to New York city in order to claim the inheritance, and finds himself at the mercy of the press when a cynical reporter (Jean Arthur) writes a series of articles about his fish-out-of-water bumbling. Mr. Deeds Goes to Town begins irreverent enough that it seems fitting Adam Sandler would some day adapt this film, but it takes a turn for the serious when a desperate man enters the narrative. He forces his way into the story, waving a gun around as if hijacking the narrative. When Deeds tries to use his fortune to help those facing the hardship of the Depression, the act of charity is used to question his sanity. It is a dose of social realism invading a film of escapism, and suddenly it is a message picture that entertains as much as it inspires. This is what Capra was best at, and he would repeat the formula in the political terrain. Instead of Deeds defending his sanity in court, Mr. Smith defends his name in Congress. This 80th Anniversary Blu-ray release comes in a collectible book with production photos, the original promotional artwork, and an essay about the making of the film by Jeremy Arnold. 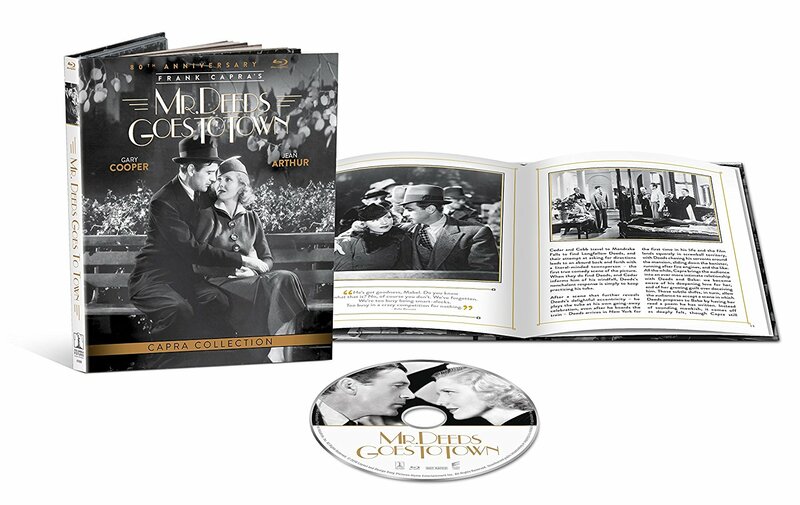 The special features include a commentary track with Frank Capra Jr., as well as a featurette with interviews of the filmmaker’s son. Likely more interesting to fans of history is the inclusion of a gallery of vintage artwork for the film, as well as an original theatrical trailer. The highlight is the restored high definition presentation, however, which I compared to my DVD copy with noticeable difference.